I saw where Shay from Mix & Match Mama shared about One Stop Bow Shop last week, and if you've followed this blog for any time, then you know that we are big, huge fans of One Stop Bow Shop. Their monthly boxes are just the best way to get monthly inspired bows for your little one. Nataleigh was obsessed when she got this month's box. I love a good neutral bow, and I really love a bow in burlap!! This is probably my favorite from the box. The red is perfection! It is the perfect red for all the Thanksgiving and holiday festivities! Nataleigh thinks that this bow looks like a perfect Hershey's bar, and y'all, its gorgeous. It's another beautiful neutral which will match everything Thanksgiving! I just loved how gorgeous her lashes look in this picture, and that bow though!! Can you go wrong in the Fall/Winter months with the perfect deep green?! 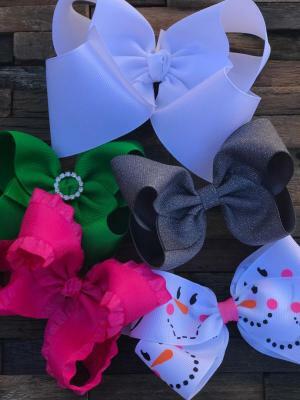 I think it's a must have, staple for your little girl's bow collection! Gobble till you wobble with this bow! This one is her favorite, and the print is simply adorable! We loved this box so much. It featured a lot of classic, neutral options, but then it brought the house down with that turkey time print! Another awesome bit of news from OSBS, is that they are shipping the December box a little earlier, so that you can have a little longer time with the perfectly holiday box! That snowflake bow is just the cutest!! She loves her some bows, that’s for sure.